High school–age twins frequently contact me via my website to request help with a project or paper about twin relationships. Most of them research issues or ideas that resonate with their developmental experiences. The other day, three female sixteen-year-olds—an identical twin pair and a fraternal twin—asked for my assistance with a presentation they were preparing for a school assembly. 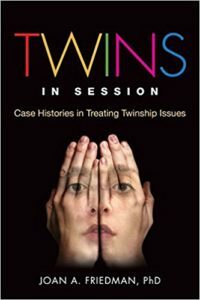 I suggested that they discuss some of the challenges that twins encounter growing up, since most people are incredulous to learn that twins suffer any emotional challenges. As I talked with them about the twin mystique, I explained that many people are shocked and disappointed to find out that being a twin is not always roses and rainbows. I love sharing the illustrative story about my identical twin Jane and me. One day, we took a walk together around our neighborhood. A passerby spotted the two of us and stopped to ask if we were twins. After we confirmed her suspicion, she inquired if we were best friends. When Jane replied that we both have our own best friend, the passerby’s expression changed from gleeful to glum. 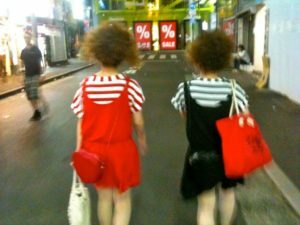 One of the identical twins shared that she and her sister made several attempts to make their own friends; however, the twins inevitably ended up sharing the friend that they had intended to make individually. The student explained that this happened because she and her sister “just get each other.” They prefer each other’s company and become impatient with an outsider needing time to get to know them. Naturally, they are accustomed to being spontaneous, authentic, and comfortable with one another. It takes time, energy, and trust to cultivate new relationships. The identical twin pair told me that they have only been separated for two days in their sixteen years together. While they would like to attend separate universities, one of the twins said that she did not think she could make it on her own. She relies on her sister for many things and does not feel strong enough to be on her own. The sisters asked me how I prepared my twin sons to attend separate colleges. I explained that our family made a long-term commitment to ensure the boys had separate experiences. While neither one of them enjoyed those times away from each other, the experiences prepared them for the difficult college transition. The identical twin girls were very open and honest about their predicaments. Hopefully, examining certain aspects of their lives together through their project will energize their thinking and help them make healthy decisions for their future.